Honda's hoping to snag some love from the Hollywood hype machine for their new green machine, the hydrogen fuel-cell-powered FCX Clarity. 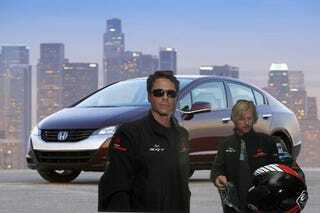 Honda's producing 200 of the fuel cell vehicles for distribution to celebrities and other Hollywood luminaries to build buzz for the 73 MPG technological wonder. True, these drivers may not need the fuel efficiency as they drive around with their poodles to pick up their grande skim latte, but whatever, they're influential. Wait a second — why does this sound so similar?